This is a co-op game announcement that surprised me mainly because I had never heard of it before. I mean, there are plenty of games I'd never heard of before, sure; but I would have sworn to you just yesterday that I could name you the great co-op shooters on the SNES/Sega Genesis consoles. 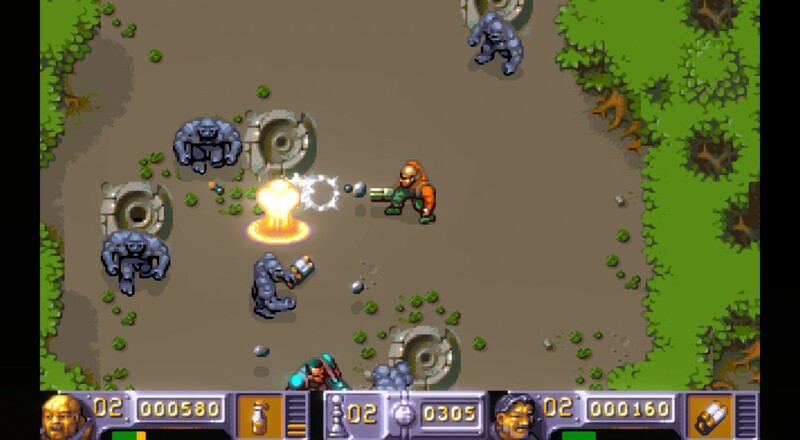 Apparently I somehow missed The Chaos Engine, a top-down shooter that had its heyday back in the early 90s. The good news is that I'll get a chance to check it out as a remake has been in the works and will see release next week. If you're like me and wondering exactly what The Chaos Engine is, allow me to recite to you the information I found on Wikipedia. A time traveller on a reconnaissance mission from the distant future became stranded in England of the late 1800s, and his technology came into the hands of the Royal Society led by Baron Fortesque (based upon Charles Babbage), a grand inventor. Fortesque then retro engineered many of the futuristic contraptions, creating an entirely different, alternate timeline. Baron Fortesque then succeeded in his greatest creation yet - the Chaos Engine - which was able to experiment with matter, and the very nature of space and time. Unfortunately for the rest of the proud kingdom, the Engine then proceeded to become sentient and captured and assimilated its creator, then began to change the countryside for the worse. Vile monsters and destructive automata appeared everywhere, and even prehistoric beasts were resurrected. Telegram wires connecting the British Isles to the European mainland are cut, and any ship attempting to enter a British port is attacked. The British Royal Family, along with members of Parliament and a large number of refugees manage to escape across the sea, bringing with them many tales of horror. The British Empire is left in tatters, and the world in economic and political chaos. This lures a number of mercenaries on a potentially rewarding quest to infiltrate the quarantined Britain, find the root of the problem and swiftly bring a full stop to it. So there you go. Mayhem and monsters in an alternative Victorian timeline with plenty of steampunk to boot. You and a friend can team up either locally or online to battle through the game's four worlds to put an end to the titular Chaos Engine. At your disposal are six hardened mercenaries from which to choose, each with their own strengths, weaknesses, and abilities. These are the Navvie, Thug, Brigand, Mercenary, Gentleman, and Preacher. While I could likely sit here and blab on all day about the things I've learned about this game since I found it existed, chances are you'd be better served by hearing about it from the developers themselves. The Chaos Engine will be released on August 29 on Steam and can be pre-ordered now for the low(er) price of $8.99. Page created in 1.9942 seconds.